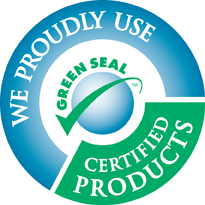 Here at Reliable Cleaning Solutions, we use environmentally friendly products and equipment, with the goal of providing you with a safe and healthy environment. Our chemicals are non-toxic, and many are derived from natural ingredients. We use HEPA-quality vacuums, which cut down on dust reintroduced into the air. Our carpet cleaning process removes dirt and allergens trapped in your carpets, in addition to making them look great.